Japan's Nobunari Oda is currently first in the Men's ISU Grand Prix of Figure Skating standings after his win at Cup of China. Nobunari Oda has had a golden start into the Olympic season. The Japanese Champion won his two Grand Prix events – Trophée Bompard in mid October and Samsung Anycall Cup of China last weekend – with strong performances. Oda almost achieved a new personal best in the short program in Beijing with 83.35 points. His personal best from the 2006 NHK Trophy stands at 83.55 points. He also scored higher in the free skating than any other man in the Grand Prix so far and is the first man to qualify for the Grand Prix Final in December in his home country. Although he didn’t receive a single negative GOE in the short and long programs at the Cup of China, Oda was not completely satisfied. “I still had problems with my jumps. I popped the second Axel and I didn’t even try the quad,” he pointed out. To do the quadruple toeloop in competition is an important goal for Oda, although the ambitious skater has done well without it so far. He landed it last year at the Four Continents Championships, but hasn’t tried it yet this year in competition as it wasn’t consistent enough in practice. The skater has had quite a few ups and downs in his career, living through both successes and defeats, but has kept his cheerful, friendly personality. In December 2005, Oda was declared National Champion of Japan and was named to the Olympic Team, but his joy lasted only for a few hours. The result was changed and the title and the ticket to Torino went to his friend and competitor, Daisuke Takahashi. Oda had repeated three triple jumps in his free skating, which is not allowed. The scoring error was only corrected after the victory ceremony. But the skater bounced back from this disappointment quickly. In the summer of 2007, Oda was stopped by the police when he rode home on his motorcycle. He was slightly was over the 0.0 drink-drive-limit that is strictly enforced in Japan, but the Japanese Federation reacted harshly, pulling him from his Grand Prix events and suspending him for three months. Oda then decided to sit out the whole season. He is a true fighter. As the 17th descendant of famous Japanese warlord Nobunaga Oda, the skater has samurai blood in his veins. “Since him, all male descendants have the syllable ‘Nobu’ in their first name,” the 2006 Four Continents Champion explained. By the way, ‘nobu’ means ‘belief’ and ‘nari’ means ‘success’ – an appropriate name for a top-level athlete. Oda splits his training time between Japan and the USA. He’s been working with coach and choreographer Nikolai Morozov since the spring of 2008, and has also been coached by his mother Noriko throughout his career. “He is one of the most talented skaters out there, and it is time for him to reach his full potential,” observed Morozov. For sure, Oda is one of the contenders for the Olympic podium this season. The men’s event promises to be the toughest competition in Vancouver with up to ten medal contenders. 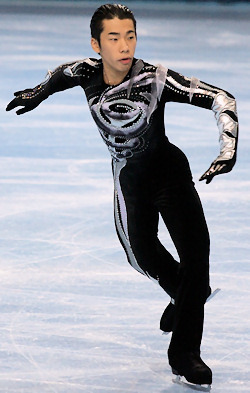 Oda knows his competitors well, except for one – Evgeni Plushenko. The samurai skater is now ready for the biggest battle of his career.